The film, which won the Academy Awards for Best Foreign Language Film and Best Costume Design, was a part of Cannes' official selection in 1963. The film, which won the Academy Awards for Best Foreign Language Film and Best Costume Design, was a part of Cannes’ official selection in 1963. The Festival de Cannes is paying tribute to Italian cinema legend Federico Fellini by basing the poster design of the 67th edition of the festival from a photograph taken from the director’s 1963 classic ‘8½’. Hervé Chigioni and his graphic designer Gilles Frappier designed the poster from the photograph which features its actor Marcello Mastroianni peering through his dark glasses. 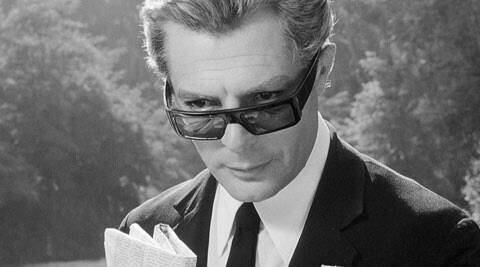 “The way he looks at us above his black glasses draws us right in to a promise of global cinematographic happiness. The happiness of experiencing the Festival de Cannes together,” the poster designer said. Mastroianni starred as Guido Anselmi, a famous Italian film director in the film who is suffering from “director’s block”. The title refers to Fellini’s eight and a half films that he had done at that time. 2 Kiku, VJ Andy, Mouni Roy in 'Jhalak Dikhhla Jaa 7' ?